What It’s About: Orson Welles tells us a tale he heard while driving through Dublin during shooting of Othello. He stopped at a crossroads and picked up a stranded motorist (Michael Laurence) who only reluctantly accepted his help. On the drive the motorist tells a story that explains why he didn’t want to take a ride: exactly one year earlier the motorist picked up a pair of women-a mother (Shelah Richards) and a daughter (Helena Hughs)-stranded at the very same crossroads. He drove them to a big old house named Glennascaul (the glen of the shadows) where they invited him in for some tea on the cold night to thank him. On the way up he notices a Chinese tapestry, which the younger woman tells him came from a man that they once knew, who traveled in the East. They have tea and the motorist has a whiskey, and he offers some cigarettes from his case-a case his uncle gave him, which he brought back from his sea travels years earlier. The motorist leaves his case on the mantle, however, and only realizes it after he’s halfway down the drive, and he realize he needs to go back to Glennascaul…. Why Watch it Today? : Orson Welles was born today in 1915. It might seem strange to feature a film that Welles only appears in as the narrator and didn’t direct or write, considering the great films he was responsible for over his career (including former Movies of the Day Citizen Kane, Touch of Evil, and The Third Man), but there is the little rule of this site that to make Movie of the Day status the author of the post not only has to be able to give an unqualified recommendation, but should have seen it, and I’m running low on films featuring Welles that fit both requirements. 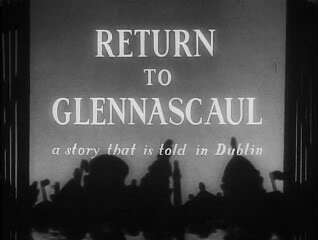 Return to Glennascaul definitely fits both: it’s a charming, Oscar nominated short film which simply but effectively tells one of the classic ghost stories. Other Choices: In addition to the films mentioned above, we’ve featured The Magnificent Ambersons, Welles’ second feature which was tragically altered by RKO; MacBeth, Welles’ iconoclastic adaptation of Shakespeare; The Muppet Movie, which briefly features Welles in one of the films many loving cameos; History of the World Part 1, which makes good use (as many films over the years did) of Welles’ distinctive and authoritative voice for its narration; and The Man Who Saw Tomorrow, one of Welles many jobs in cheap-jack documentaries towards the end of his career. This entry was posted in "Foreign Film", Adaptation, Arthouse, Based on an Urban Legend, Black and White, Ghost, Horror, Independent, Movie of the Day, Mystery, Short and tagged abandoned house, Best Short Subject Nominee, Dublin, ghost story, haunted house, hitchhiking, Ireland, Orson Welles.